Dallying In The Dirt, Issue #170 --- I'm taking the canoe out to the overwintered parsnips. The dinner plans for Saturday evening may have to change. The overwintered Parsnips were going to be roasted along with some Potatoes and Carrots, both of which I need to purchase, but my rain gauge which tops out at 1.25" is overflowing after last night’s rain. I will need to get the canoe out of the garage to get to the Parsnips and even then digging them out of complete mud is not a pleasant prospect. The Asparagus has burst through the mulch everywhere now and we are gorging ourselves on this delicacy. There should be enough on Saturday to compensate for the lack of Parsnips. We really didn’t need that much rain. Early in the week, a much anticipated box arrived from Tyler, Texas. That is where David Austin Roses, the wonderful breeder of old English roses, grows their plants for the North American market. Inside the box were two large, bare root, Roses. Princess Alexandra of Kent and Gentle Hermione. Living where I do, the hardiness of Roses is always a question. David Austin is now producing Roses grown on their own roots which tend to be somewhat hardier than their standard Dr Huey, rootstock. In a perfect world we could get them on a Rugosa rootstock that was hardier. 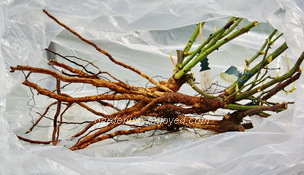 You can see from the picture the size of these plants and in particular the length of the roots. That requires digging a decent sized hole. I found a spot for the rather large Gentle Hermione in the west, fence garden. Finding spots to accommodate new plants is always a problem in my somewhat crowded yard. I dug a hole about 40 cm (15") deep and went to get some compost to add to the soil and the rose bush. When I returned to the planting spot, about 3 minutes later, there was at least 5 cm (2") of water in the bottom. I had found the water table. The instructions were to water the plant thoroughly, I’m not sure that meant submerging the bottom of its roots below the water table. I mixed in the compost and planted it anyway. The we got last night’s rain. I will be watching poor Hermione carefully to see if she thrives or survives in her well watered location. I did not hit water planting Princess Alexandra in the front garden. One of the joys of gardening is the unexpected and unplanned things that Mother Nature surprises us with. My son in law gave me a little Heron sculpture a few years ago and it gets accidentally moved around the edges of the ponds, sometimes even falling in for a swim. I could never have purposely positioned where it is this spring. The Tulip that is growing gracefully up through it is an accidental but delightful happenstance. Elsewhere, actually everywhere, in the garden the Tulips are at their glorious peak. The late spring seems to have compressed the season so that the early and late varieties all seem to be blooming at the same time. The front yard is a blaze of colour. There are close to a thousand Tulips planted there and most are in bloom now. If you know where I live and many of you do, drive by over this holiday weekend and have a look. Feel free to get out of the car and wander through. This is the front yard’s glory moment. If you are looking closely at the Tulips and happen to see Red Lily Bugs on the emerging Lilies, feel free to crush a few. If I’m around I’ll even let you try out my needle nosed pliers. 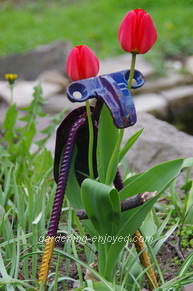 I’m searching for great masses of Tulip foliage that are producing only leaves and no blooms. Many of them will be dug and discarded as they are unlikely to return to blooming in the next couple of years. Despite the very soggy parts of the vegetable garden, I am carrying on with my usual preparation and planning. This week, all of the large seeded, quick growing veggies were seeded into their little cell paks in anticipation of a warm, drier garden in the next couple of weeks. Cucumbers, and the several varieties of Summer Squash, are now in the warm soil and starting to emerge. Hopefully they will make the garden by the first week of June without using the canoe. I also started the Morning Glories. Heavenly Blue is one of my favourite flowers, they climb rapidly and that clear blue colour is quite rare in the garden. You cannot start them too early or they will start to twine all around each other and then planting them is like unknitting a sweater. They will of course share their trellis with the several varieties of Pole Beans. Some years I plant those seeds directly in the ground and some years I start them a week or two early. If the bathroom reno leaves me some time this week I will go and plant, at least some, of those bean seeds. Carol Asks? Liquid borax to kill ants??? Does it work? I have lots of ants I want gone. Where do you get it and how do you apply it. Straight from the bottle on the the ant hills? Ken Answers! I have to admit to cheating a bit. The ant killing bottle with the liquid borax has been on my shelf since before it became one of the banned chemicals in my part of the world. I have since gone to the garden centre and acquired the latest material which contains permethrin and it seems to be effective. Claire Asks? My lawn is quite thin and patchy after this long winter, can I add some grass seed to thicken it? Ken Answers! Grass seed work best in the fall but overseeding and top dressing the lawn in the spring can be an effective technique for fixing up those bare bits. 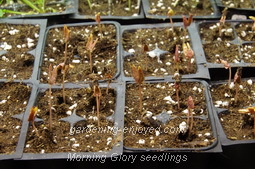 Look for a quick germinating seed, rake out all of the dead grass and then spread the seed quite thickly. Over the seed, rake about 1/2" of good quality topsoil to help keep the seed moist and to slow down the visiting hungry birds.